Big changes are occurring in the mobile space. Companies want to stay current, but often the most difficult hurdle is figuring out where to start, and subsequently where to invest your resources. A lot of people are in a situation where their client, be it their boss, other departments, or external clients, are looking for a “mobile solution”, and its up to you or your team to point them in the right direction. Recent trends are saying that native apps are garnering a bigger piece of the pie, where it used to be app usage was split 50/50 between native and web apps. There’s also the school of thought that says each fits their own purpose. The mobile web is better suited for quick-hit content (you don’t want to download an app to get a flight update, for example), and will always reach a larger audience. Interactive games perform better as native apps, as well as apps that rely heavily on multiple native phone features. One’s not necessarily better than the other. It comes down to the client’s requirements, and how they translate into mobile features. Like just about everything else that’s design-related, it depends. One approach that works well is making sure your web site works on mobile devices first, and then turning your attention to creating a native mobile app. This way, you’re first establishing that your content will reach the widest possible audience, and also likely learning about design practices that can be applied to a native application. The same codebase for your mobile web site can be ported to a native application environment will little inconsistency. In order to create mobile apps using web technologies, there are two big technologies that make things a lot easier: jQuery Mobile and PhoneGap Build. jQuery Mobile provides a baseline of buttons, transitions and menus that allow you build a mobile application quickly and easily. Using jQuery Mobile as a baseline means you won’t have to debug your user interface across mobile devices, because the jQuery Mobile team has already done this. PhoneGap Build converts the code you write using jQuery Mobile into native apps, ready for you to submit to various app stores. Using jQuery Mobile and PhoneGap Build, any web designer or developer who is able to produce a mobile web site will be able to leverage their existing skills to create mobile apps in a fraction of the time it takes developers to build mobile apps from scratch for individual platforms like iOS, Android and Windows Phone. Creating mobile apps with web technologies also means you can port your apps to emerging platforms, like Firefox OS, or Tizen, or even platforms that don’t exist yet, like a web interface on your refrigerator. If you’re interested in learning more about the technologies and processes surrounding building mobile applications using web technologies, check out my book. 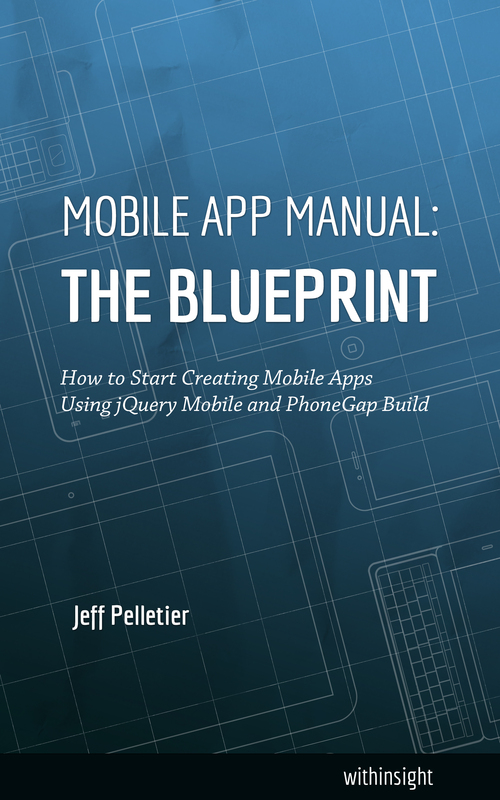 It’s short, sweet, and will have you creating your own mobile apps in no time.